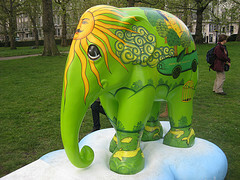 Hunting down the 260 plastic trunkians of the Elephant Parade is no easy task. Even Londonist has only photographed half of them so far. Matters were helped a week or so ago, when the official site gave up its phone-crashing PDF guide in favour of a Google Map. Still, that's not the most mobile-friendly of solutions, so it's good to hear that app-meisters Longtap have created a free Android version of the map that can be used without troubling your 3G or wifi circuits (though if you do, it can point you to your nearest pachyderm). This must break some kind of record for 'most niche app' - you have to (a) be in London over the next month, (b) be interested in tracking down plastic elephants and (c) have an Android phone. But for those who fit into this less-than-jumbo corner of the Venn diagram, this will be a very useful app indeed. Available now in the Android Marketplace.